Trikustik GmbH deals exclusively with the issue of room acoustics. See also: Building Acoustics, Room Acoustics. Acoustic design is the attempt to give a product a pleasant or unique sound. For example, the closing of car doors, sounds from electrical appliances or the acoustic noise made by food when eating have long been subject to design by acoustic experts. In architecture, it corresponds to the attempt to give a high-quality or individual acoustic character to the room. Correct positioning of the room and use of absorbers tuned to a specific frequency range are required for this. Good acoustic design has a subliminal – yet strong – effect on the perception of a room’s quality. In order to work out this ratio, the value of Alpha-s (as) is calculated and converted to an Alpha-p (ap) value. Three alpha-s values are rounded to one alpha-p value as part of this calculation. An absorber measured for 100 to 5000 Hz therefore has 6 different alpha-p values (125Hz, 250Hz, 500Hz, 1000Hz, 2000Hz and 4000Hz). The Alpha-s (as) is the most accurate measure of sound absorption, as this is specific to a narrow range of frequencies. Where the value of 0 means no absorption, and the value of 1 represents complete absorption. Multiplying the Alpha-s by 100 gives the sound absorption in %. 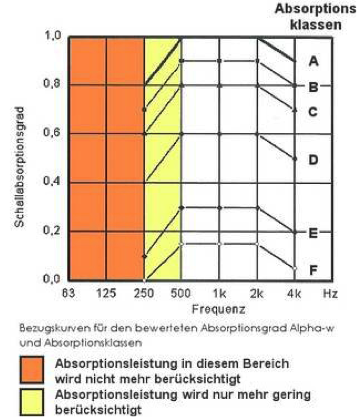 Alpha-s (250Hz) = 0.88 therefore indicates 88% sound absorption in the 250Hz frequency range. An absorber which has been measured with sufficient accuracy (from 100 Hz to 5000 Hz) has 18 different alpha-s values (100Hz, 125Hz, 160Hz, 200Hz, 250Hz, 315Hz, 400Hz, 500Hz, 630Hz, 800Hz, 1000Hz, 1250Hz, 1600Hz, 2000Hz, 2500Hz, 3150Hz, 4000Hz and 5000H). Alpha-s, measured in one-thirds octave values, and Alpha-p, which has been converted to octaves, are used for the calculation. As an aid, the so-called reference curve is used. This is moved vertically in steps of 0.05 until the sum of negative deviations from the octave value does not exceed 0.10. Alpha-w is then measured at 500 hertz. Significantly increased absorption performance in certain frequencies of at least 0.25 are expressed by bracketed letters L = low (250 Hz) M = medium (500 and 1000 Hz) or H = high (2000 and 4000 Hz). Thanks to these additional letters the Alpha-w measure is somewhat more precise than the absorber classes. Nonetheless, for high-quality acoustics the frequency profile of the absorption capacity must be considered and adapted to the requirements of the room. 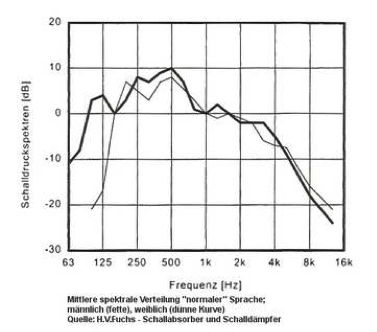 If rooms are to be used for musical performances, a higher reverberation time for frequencies below 250 Hz is desirable, as this creates sound “warmth”. The bass ratio is the ratio of the reverberation time in the frequencies of 125 Hz and 250 Hz to the frequencies of 500 Hz and 1000 Hz. For musical performances (as opposed to music practice rooms and music lessons rooms) a bass ratio from 1.1 to 1.3 is sought. The rate at which air pressure changes (for airborne sound) is called the frequency. It is measured in Hz (Hertz). 1 Hz is therefore one oscillation per second. When reproducing sound, the frequency determines the pitch. In acoustics, a doubling of the frequency corresponds to the interval of an octave. Thirds (1/3 octaves) are used as smaller intervals. Frequencies between 16 Hz and 20 kHz are audible to the human ear, that being around 10 octaves. There is large variation between individuals and the upper limit falls considerably with age. Sounds with a frequency below 16 Hz are referred to as infrasound (subsonic), while above 20,000 Hz is ultrasonic, and above 1,000,000,000 Hz (1 GHz) is hypersonic. A sound-absorbing property is often attributed to panels or wooden elements. Sound absorption can only be achieved by perforation and wall spacing, however. In terms of the demands placed on sound absorbing measures, consideration of sound radiation is of great importance. Although the volume level serves well for labelling the volume of different sounds, perceptual differences can only be demonstrated in an unsatisfactory manner. For this reason, loudness (measured by the sone) was introduced. In acoustics, when doubling the loudness value, a sound is respectively perceived as twice as loud. A volume level of 40 phon loudness is given a value of 1 sone. The sensitivity of the ear is frequency dependent. 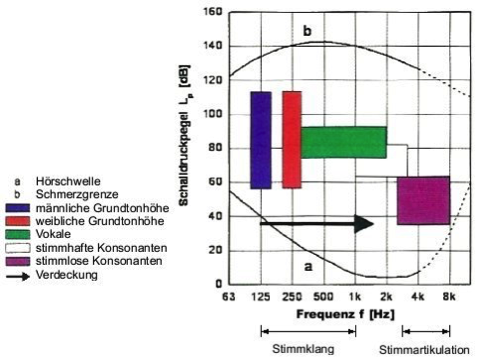 The threshold of hearing at 1000 Hz is about 0 dB, whereas at 20 hertz, it’s about 70 dB (see diagram above). In order to cope with these perceptual differences, there is the volume level (measured in phon). At a frequency of 1000 hertz, the sound pressure level (dB) and volume level (phon) are identical. Instead of the volume, the loudness (sone) can also be specified. The reverberation time – that is the amount of time a noise reverberates – (sound pressure decrease by 60dB – i.e. to a millionth of its original value). It is the most important indicator of good acoustics in general and room acoustics, and is expressed in seconds. The reverberation time depends on the volume of the room and the absorption coefficient of its surfaces. Desired reverberation times vary depending on how the room is to be used and the room size (see diagram below). The actual reverberation time may be optimised by the absorption properties of the room surfaces. When speaking, an excessively long reverberation time causes subsequent syllables to be overlapped by those preceding, due to the sound fading slowly. This reduces intelligibility. If sound fades too slowly in music, especially at low frequencies, this causes sounds to merge, producing a “muddy” musical impression. If the reverberation time is too short, the room gives a ‘dry’ impression, and sound in the room does not “carry”. Too short a reverberation time can also lead to insufficient volume in a large room, especially at the back of the room, because there aren’t any reflections to increase the volume. 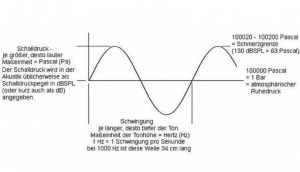 The optimum calculated reverberation time is then applied to the entire frequency curve. Gives the average sound absorption of the one-third octave values 250, 500, 1000, 2000, rounded to the nearest multiple of 0.05. 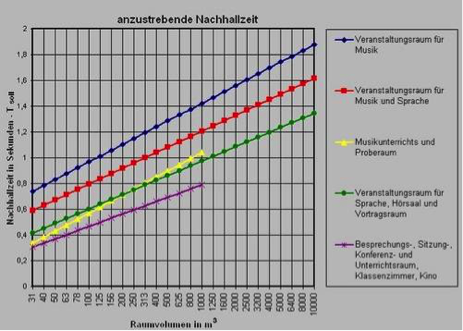 An NRC of 0.80 therefore means an average sound absorption of 80% in the frequencies of 250, 500, 1000 and 2000 hertz. Room modes are particularly relevant for small rooms used for music (high proportion of low frequencies). The larger the volume of the room, the more the room modes shift towards the lower frequencies, becoming less important. Room modes are formed between two reflecting walls, in the frequency in which wavelength is half (or a multiple thereof) of the distance between the walls. For example, the wavelength at 50 Hz is 680cm, and 340cm at 100Hz. A room which is 340cm wide therefore tends to form a standing wave at 50 Hz and at 100 Hz. Within these eigenmodes, a highly uneven local sound field is present. This is visualised very effectively in the room mode calculator. Using bass absorbers, these standing waves can be mitigated. These absorbers have to be mounted on the surfaces between which the natural frequencies occur. If possible however, the proportions of the room should be considered during the planning phase. Natural frequencies always occur particularly strongly when one of the room’s dimensions is an integral multiple of another. So for example, in a room that’s twice as wide as it is high. The deviations from integral multiples should be at least 10%. The larger the volume of the room, the more the room modes shift towards the lower frequencies, becoming less important. Sound waves are pressure variations in an elastic medium. The medium may be gaseous (airborne sound), liquid (waterborne sound) or fixed (structure-borne sound). The movement is transmitted to the adjacent particles by bumping. This results in compression and thinning of the material and the propagation of the sound. In a vacuum there is neither sound propagation nor acoustics because there is no matter. Panel absorbers are thick panels which are installed at certain distances to a wall or ceiling. According to area density, stiffness and clearance to wall/ceiling, these plates begin to vibrate at certain resonant frequencies. Through this process energy in the sound field dissipates, mostly narrow-band and deep resonant frequencies (low frequency absorbers). After extensive experimentation and evaluation of the research results obtained in our acoustics laboratories, we ceased our activities in this area of product development. Despite what some theories may postulate, every change in the stress ratios of the panels (mounting distances, air humidity, mineral wool placement loose/tight etc.) led to varying results. Absorption performance was either entirely negated or suddenly present in a completely different frequency range. Thus as a low frequency absorber we recommend our micro-perforated Micro L1, which offers consistent and reliable results thanks to a completely different kind of absorption principle. Panels, boards, tiles and other elements made of wood are sometimes ascribed sound-absorbing properties per se. Yet sound absorption is only truly achieved through perforation and distance to a surface, e.g. a wall. And in the case of panel absorbers, panels made of wood exhibit lower effectiveness and performance stability than those made of metal (increased effects on stress through room humidity and temperature, inadequate relationship between mass and stiffness, etc.). This is the arithmetic average of the absorption coefficients for the twelve one-third octave bands from 200 to 2500 Hz, rounded to 0.01. An SAA of 0.82 means an average absorption of 82% for the frequencies 200 Hz, 250 Hz, 315 Hz, 400 Hz, 500 Hz, 630 Hz, 800 Hz, 1000 Hz, 1250 Hz, 1600 Hz, 2000 Hz and 2500 Hz. Sound waves are an elastic medium producing an audible sensation. The medium can be gaseous (airborne sound), fluid (waterborne sound) or solid (structure-borne, also called solid-borne sound). Sound is an oscillation in pressure, stress particle displacement. It results in both compression and thinning of matter and propagation of sound. In a vacuum, sound cannot travel, and there can be no acoustics, because there is no matter. Multiplying the sound absorption coefficient of a component with its surface in m², the result is the equivalent sound absorption area. 100 m² of acoustic panels are mounted with an absorption coefficient of 0.7. 100 x 0.7 = 70 m² additional equivalent sound absorption area. The equivalent sound absorption area can be applied not only to the boundary surfaces of a room, but also to the objects and persons therein, and is therefore of fundamental importance to the calculation of the room’s acoustic characteristics. By doubling the equivalent absorption area the sound pressure level decreases by 3 dB. Gives the ratio of absorbed to reflected sound energy. An absorption coefficient of 1 means 100% sound absorption, a value of 0 means 0% absorption (= 100% reflection). The sound absorption coefficient is dependent on the frequency. Sound absorption classes are classified with the letters A-E. These are derived from the weighted sound absorption coefficient “Alpha-w”. 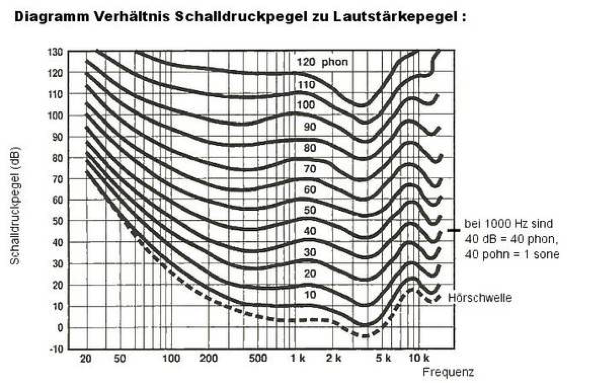 The frequency curve of the sound absorption cannot be expressed using these classifications. In fact, medium or low absorber classes with increased sound absorption performance in the middle or lower frequency range are generally required for optimum reverberation times. In our view, this classification system is usually insufficient as a result. Although it makes things more complex, the entire frequency curve of an absorber must nevertheless always be considered. Sound pressure is the change in pressure which is caused by oscillating air molecules. This is perceived as volume. It is remarkable to consider how very small these changes in pressure in fact are. The atmospheric static pressure surrounding us is about 1 bar, which is around 100 000 pascals – the pain threshold is found at a change in pressure of about 63 pascals (= 130db SPL) and the hearing threshold at 0.00002 pascals. In other words, an air pressure fluctuation of 0.063% from the static pressure = pain threshold = 130 decibels (dB), while an air pressure fluctuation of 0.00000002% of the static pressure = hearing threshold = 0 decibels (dB). The perception and pain thresholds are frequency dependent (low-frequency acoustic processes require greater sound pressure levels than high frequencies in order to be perceived, for example) and vary greatly from person to person. A sound field can also be described by the sound power and the sound power level (dB SPL). In acoustics, sound pressure level is the most common metric. The unit for the level of sound pressure is the decibel (dB). The sound pressure level is derived from sound pressure – 0 dB (hearing threshold) is 20 micropascals. The pain threshold is around 130 dB. This is based on a logarithmic scale. When adding two equal levels together, the sound pressure level increases by 3 dB. Sound pressure level changes of about 1 dB can barely be perceived. A difference in sound pressure level of 10 dB is perceived as twice as loud (at 1000 Hz and 40 dB). A sound field can also be described by the sound power and/or the sound power level. The sound pressure level depends on the location, so it has only limited suitability for the description of sound sources. 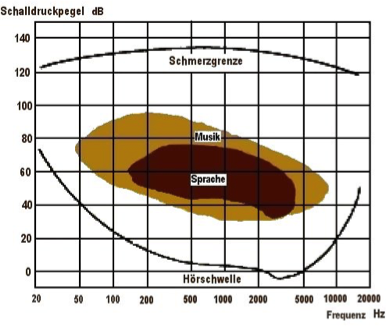 In acoustics, the sound power level is therefore used for sound sources, using the unit of decibels (dB SPL). The speed of sound indicates how quickly sound travels. It is measured in meters per second. The speed of sound propagation depends on the medium through which the sound travels.